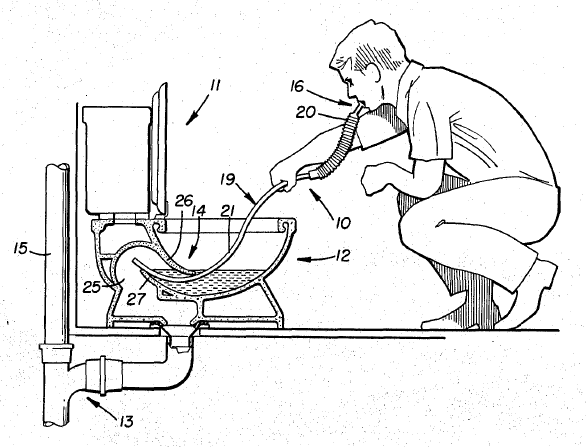 The theory behind the toilet snorkel is that you are likely to become trapped in the upper floors of a burning high-rise building — a hotel, an office building, or a high-rise apartment or condominium building. Most of the building is above the reach of any fire department's highest-reaching ladder trucks. You don't have firefighters' protective suits, helmets, masks, and breathing apparatus. What can you do? Well, if you had prepared by bringing along a toilet snorkel, then you could squat beside the toilet and breath sewer gas until the fire is put out, or firemen arrive with rescue breathing equipment, or the building collapses. The toilet snorkel could save your life! Or maybe it's just one more thing to worry about. 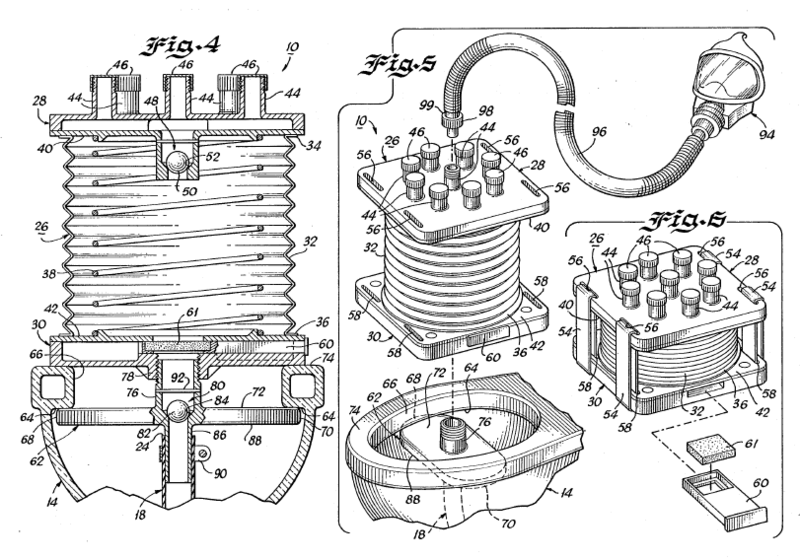 U.S. Patent 4,320,756 was issued in March, 1982. We live in an age of wonders! 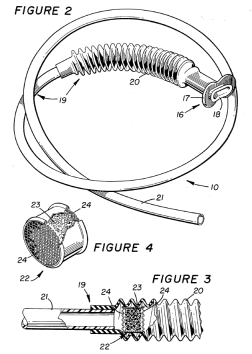 The toilet snorkel hose has a soft elastomeric (rubber or plastic) snorkel-type mouthpiece "having a teeth-engaging bite ring  formed integrally therewith", thus enabling the user to "bite-down onto the mouthpiece to hold it in sealed communication with one of his respiratory intake passages (mouth)." Well, yes, that will be your mouth, unless you are one of those rare individuals with teeth in your nostrils. As he says: "It is well known that upon flushing of the toilet, a water trap will form in the toilet bowl to block sewer gases from entering the bathroom proper. Conversely, the water trap functions to prevent toxic smoke in the bathroom from passing thereby." So, the device provides the lesser of two evils: you can breathe sewer gases instead of toxic fumes. 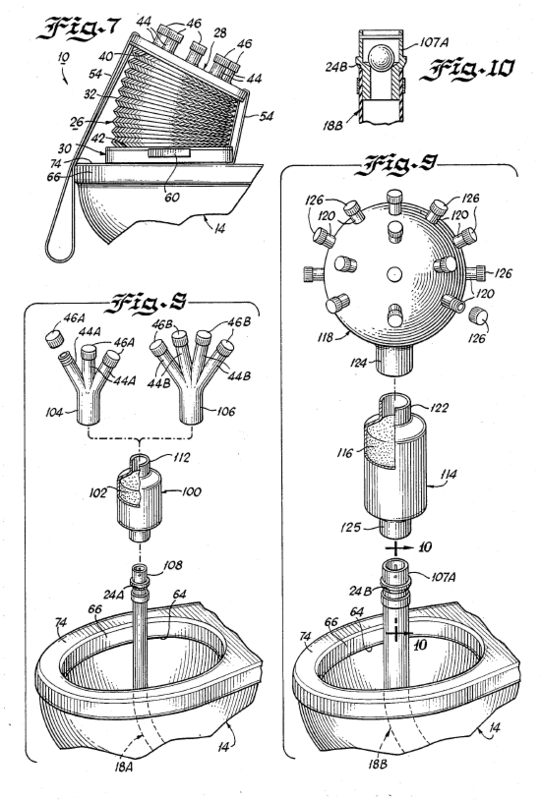 A filter canister (item number 22 in the diagram) filled with charcoal can be used "to adsorb any noxious or toxic impurities which may be contained in the air inhaled by the user." 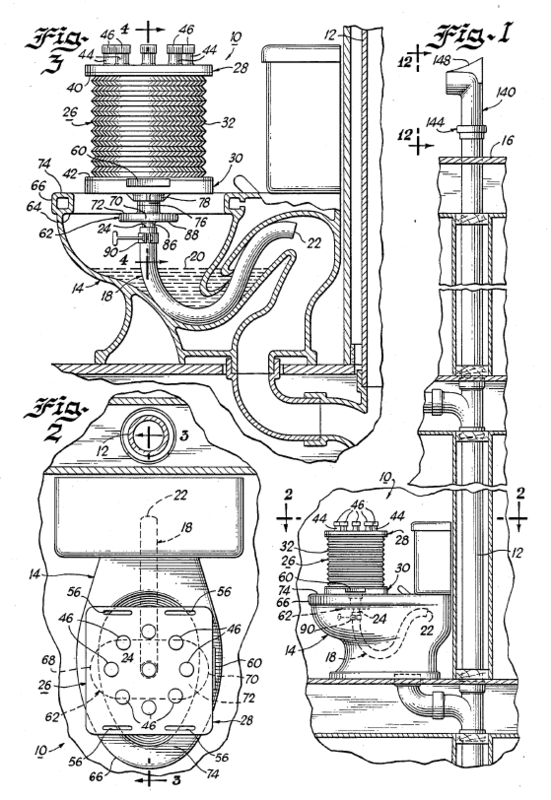 The inventor recommends that the toilet be freshly flushed to expel accumulated sewer gases from the air chamber within the rear of the toilet (#25), which "will also automatically create a suction effect in sewer line 13 to draw fresh air into chamber 25 of the toilet that is in open communication with air vent 15. Such flushing will also automatically create a suction effect in sewer line 13 to draw fresh air into chamber 25 via the fresh-air vent. Water trap 14 will automatically be formed, as is well known." The user inserts the tubing end of the snorkel through the water trap, places his mouth on the mouthpiece and blows out the small amount of the water and then he's ready to "start inhaling fresh air and oxygen through the device and exhale through his nose. The user can maintain this breathing procedure for hours and until he is rescued." He explains that our hypothetical trapped hotel guest can even rescue a fireman who has depleted his oxygen tank by buddy-breathing on the toilet snorkel. 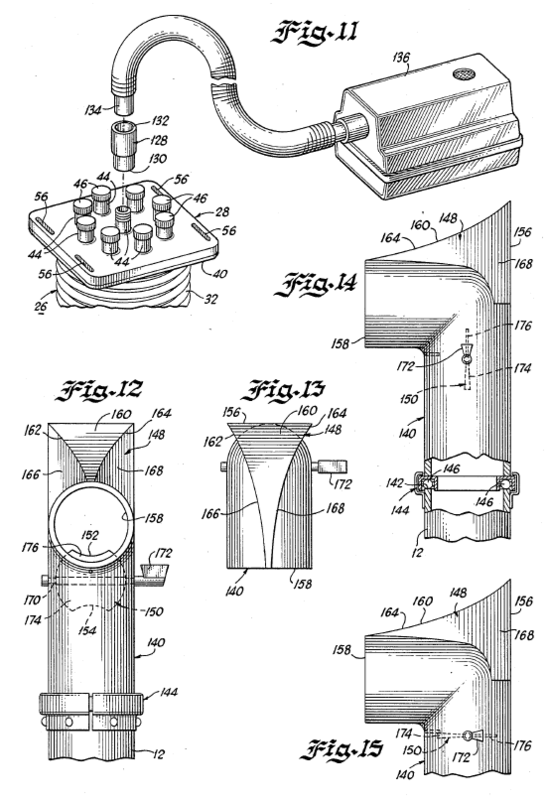 As amazed as you may be right now by American toilet snorkel ingenuity, just wait until you see the design described in U.S. Patent 4,901,715, issued in February, 1990, Apparatus and method for breathing through the soil-stack during a high-rise fire, by Timothy E. Mulcahy. It uses a large bellows mounted onto the toilet bowl rim, and so it is not the sort of small object that can be stashed in the typical traveling businessman's rolling suitcase. This apparatus would need its own piece of luggage, preferably hard-sided. Business travelers with enough annual airline miles to qualify for their airline's elite traveler program can check two pieces of luggage for free. The rest of us will have to feed the airlines' insatiable greed for add-on fees if we are going to bring our toilet snorkel bellows along on our trips. Vigorous pumping could provide an air supply for the stranded hotel guest plus all members of a fire rescue team with no need for passing around a shared mouthpiece. I really like the U.S. Patent Office's use of Victorian-era illustration style. It makes these contraptions look even more like something that Wile E. Coyote would assemble from the inventory of the Acme Corporation.